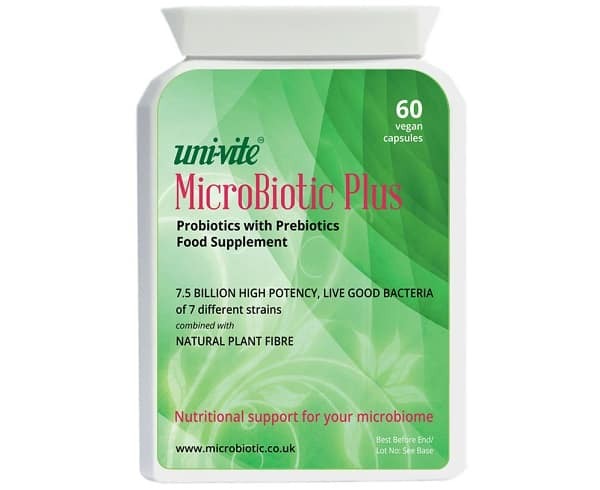 MicroBiotic Plus contains 7 different strains of PRObiotic bacteria, which can resist the harsh, acid environment of the stomach and therefore reach the gut. These friendly bacteria are guaranteed to be live on consumption, and they pass into the digestive system where they can form probiotic colonies. Probiotic microorganisms prevent the growth of harmful bacteria, help absorb nutrients and assist in the production of B and K.
MicroBiotic Plus contains 250mg of natural resistant plant fibres. Each capsule contains 125mg of INULIN and 125mg of FRUCTO-OLIGOSACCHARIDES or FOS. PREbiotic fibres pass into the colon where they are used as food by good bacteria, helping them to form and promote the growth of probiotic colonies. The strains act synergistically in specific parts of the gut for multiple benefits. Each of the strains we use has been developed building on four decades of research at Nebraska University and around the world.